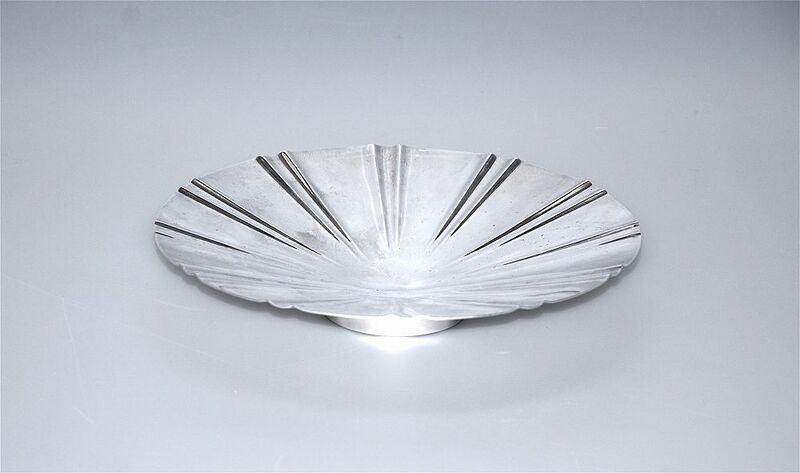 This is a very unusual silver plated tazza by Walker & Hall. Made in 1942 the slightly concave round top has a stylised raised sunburst pattern. It is supported by a small round foot and the underside of the base has the Walker & Hall trade mark flag with "W&H" stamped on the fluttering pennant. Engraved underneath the flag is a cartouche with the letter "O" inside being the date letter for 1942 and below that in rectangular cartouches are "52338", "A1" and "Walker & Hall Sheffield".